Here is a list of 43 zero carb foods, including meat, seafood, dairy, vegetables, drinks, oils and condiments. There is such a thing as a no carb diet. Although I find this way of eating a little too extreme, I still find it useful to know what can be considered “free” food in terms of carbohydrates. All these foods do not naturally contain carbohydrates, apart from those in the vegetable list which contain between 0 and 1g net carb per serving. For meats and seafood, the key is to go for unprocessed food. As soon as someone process it (think ham, bacon, jerky, burgers) there is a higher chance that they have also added some carbs! 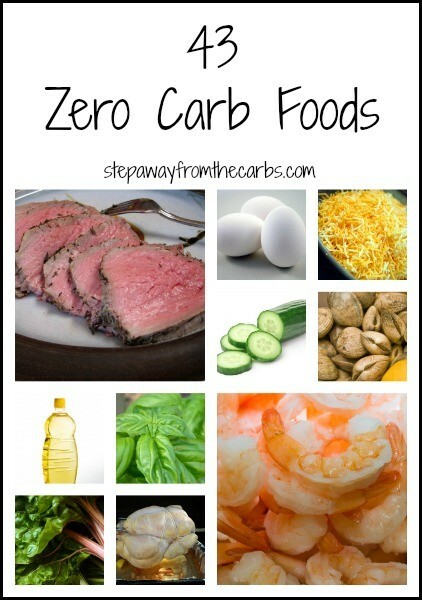 And just a quick note about these zero carb foods and recipes – just because they lack carbohydrates doesn’t mean you should eat unlimited amounts of them. Moderation, my friends. Moderation.